Mole activity has suddenly increased in the past few weeks. Perhaps you’ve noticed that, after an early summer break, moles are back with a vengeance! We’ve also noticed a record rabbit population this summer, along with the usual deer damage to certain plants. Left unchecked, all these critters can lay waste to your lawns and gardens. 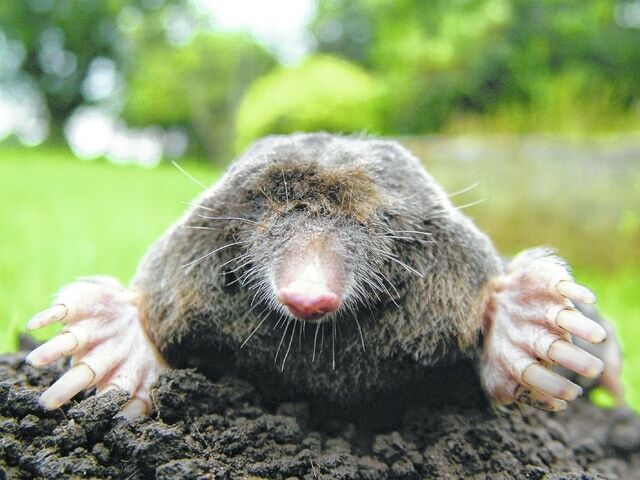 We’ve tried numerous ways to eliminate moles from our lawns, and only one has actually worked over a long period of time. We treat the infested area with a castor oil-based repellent called “Mole-Max”, which makes their food taste bitter, causing them to leave the treated area. It comes in a granular form, and is easy to apply with a lawn spreader or by hand-broadcasting. Mole-Max is the easiest, neatest and longest lasting deterrent we’ve found. Once it soaks into the ground, by watering or normal rain, it gives earthworms and grubs a bitter taste. It isn’t toxic to pets and won’t hurt plants or lawn grass. Starting close to the house, we spread the Mole-Max in ever-widening circles. We make a few passes, wait a few weeks, and make a few more, further away, gradually driving the mole population ever further from our house and gardens. In our case, the treated areas remain free of moles for several years thereafter. A fifty-pound bag of Mole-Max costs $79, and treats about half an acre of lawn. We’re happy to spend that amount each year to eliminate the unsightly tunnels and mud mounds. It’s not nearly as satisfying and fun as trapping or shooting ugly, disgusting moles, but it solves the problem for much longer. Embittering their food supply works for rabbits and deer as well, but the remedy is somewhat different. Called PlantSaver, it’s a plant food tablet containing one percent Denatonium. Pressed two inches deep in the root zone of any ornamental plant, it feeds the plant while at the same time giving it a terrible bitter taste. Deer and rabbits simply won’t eat more than the first nibble. Denatonium is the most bitter substance known. It is widely used to prevent accidental poisoning by products such as rat poison, anti-freeze, rubbing alcohol and nail polish remover. It isn’t poison, but even trace amounts are unbearably bitter to eat. When it is absorbed by plants, it has a long-lasting effect. PlantSaver is effective for at least a year. Installing PlantSaver with new plants or adding it to existing plants will only work once the Bitrix is absorbed and travels up into your plants. In the meantime, you need to spray your plants with an effective deer & rabbit repellent, perhaps several times. We have had very good results with “Liquid Fence” and with Bonide “Repels-All”, both of which come in ready-to-use pump spray bottles or in cost-effective concentrates you mix yourself. Can’t find Mole-Max or PlantSaver in your neighborhood? Take a little road trip to Winchester, Ohio, and visit our nursery. We can send you home with the right solution for many, many gardening problems, along with personal advice and perhaps a little fresh color for your fall garden.